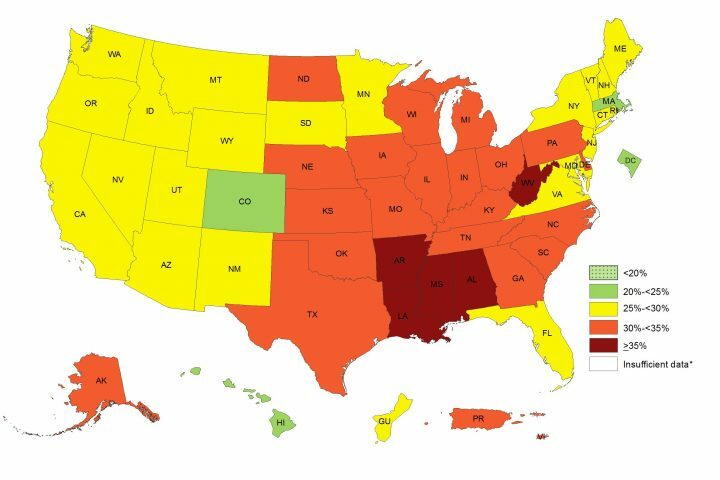 Obesity is a significant public health concern in the United States. The condition, which is prevalent in nearly 40 percent of adults nationwide per an October 2017 report from the U.S. Centers for Disease Control and Prevention, is linked to serious health risks such as heart disease, stroke and type 2 diabetes. How the media covers obesity offers clues to understanding broader attitudes on the issue, such as views about who is to blame for its prevalence, and where responsibility lies in addressing the issue. Visuals are one element of media coverage of obesity that shapes public perceptions on the subject. Research has shown how visuals accompanying news videos on obesity often feature unflattering portrayals of isolated body parts or obese individuals partaking in unhealthy behaviors. These visuals can in turn contribute to stigma and negative perceptions of obese individuals. In narrative, too, media coverage reflects certain attitudes held about obesity. Consider the difference, for example, between coverage that focuses on societal drivers of obesity — such as lack of access to healthy food — and associated policy responses, like soda taxes, city bike initiatives and school nutrition programs, as compared with coverage that focuses on personal responsibility for obesity, like individuals’ unhealthy food choices and lack of exercise. Research suggests that a great deal of coverage has focused on personal responsibility, though increasingly environmental factors and individual factors out of one’s control, such as genetics, have received more media attention. Findings conflict as to whether shifting the framing of coverage of obesity has the ability to shift individuals’ attitudes toward its causes. To help reporters consider how best to cover this important topic, Journalist’s Resource has summarized the findings of several recent studies on the media’s coverage of obesity. Thomas, Christopher N.; et al. Preventing Chronic Disease, 2017. doi: 10.5888/pcd14.170107. Looking at news coverage from 2011 to 2013 of obesity in communities that received funding from the CDC, this study finds that most of the 2,978 items reviewed had either a neutral or positive tone. Positive tone was defined as coverage that aligned with the CDC’s health messaging on obesity; neutral tone was defined as a statement of facts without a particular viewpoint. Though individual causes of obesity (e.g., overeating) were discussed more frequently than environmental causes (for example, lack of gym classes in schools), environmental solutions (e.g., soda taxes) were discussed more often than individual solutions (e.g., portion control). 43 percent of newspaper items described obesity as an epidemic; only 10 percent described it as being preventable. Garyantes, Dianne M.; Murphy, Priscilla. Health Communication, 2017. doi: 10.1080/10410236.2017.1399507. Comparing the coverage of two mainstream newspapers to two ethnic newspapers in Philadelphia, this study finds that mainstream outlets favored public policy efforts to address the obesity epidemic whereas the ethnic papers emphasized self-efficacy (e.g., individual choices like healthy eating and exercise). The two ethnic newspapers (which served Hispanic and African American communities) used community-based organizations as sources, direct mention of at-risk groups for obesity and common, non-jargon language — all indicators of cultural competency (the development of skills needed to communicate effectively with people from cultures other than their own). However, the African-American newspaper, The Philadelphia Tribune, discussed obesity less than expected by the researchers when compared with the overall sample. Bresnahan, Mary; et al. Fat Studies, 2017. doi: 10.1080/21604851.2016.1129930. Of 319 online news stories and comments published about former New Jersey governor Chris Christie between 2011 and 2014, there were 1,490 fat references made in total. Over 80 percent of these references were negative. Luck-Sikorski, C.; et al. BMC Public Health, 2017. doi: 10.1186/s12889-017-4275-y. Sun, Ye; et al. Journal of Health Communication, 2016. doi: 10.1080/10810730.2015.1039676. This study describes the results of an experiment where 377 participants read a news article framing obesity as either an individual or societal issue. The results indicate that “a news article with a societal frame indeed made participants more likely to attribute the obesity problem to social conditions, which in turn led to stronger beliefs in the responsibility of the government, food industry and marketing sector to solve the problem.” Individually-framed articles did not change participants’ beliefs about obesity. So, Jiyeon; et al. Health Communication, 2016. doi: 10.1080/10410236.2014.940675. In the realm of social media, and Twitter in particular, certain posts about obesity get more engagement than others, this study finds. Looking at a purposive sample of 120 tweets, the authors determined that tweets about obesity that get shared the most on the platform are emotionally evocative, humorous and address individual-level causes. Puhl, Rebecca M.; et al. Journal of Health Communication, 2013. doi: 10.1080/10810730.2012.743631. This study looked at news videos about obesity aired between 2004-2010 on five major websites to understand portrayals of overweight/obese adults and youth. They found the majority of portrayals in the 371 videos studied were negative. These videos often featured “an unflattering emphasis on isolated body parts,” as well as subjects eating unhealthy foods and remaining sedentary. Obese individuals were also more likely to be shown as headless than non-overweight individuals. Puhl, Rebecca M.; Luedicke, Joerg; Heuer, Chelsea A. Journal of Health Communication, 2013. doi: 10.1080/10810730.2012.757393. African American women who were obese elicited higher ratings of dislike than white adults of any gender depicted. Shugart, H. A. Obesity Reviews, 2013. doi: 10.1111/obr.12043. The author of this study suggests that while the personal responsibility narrative in media representation dominates, another discourse is emerging — that of culture. The author looked at national news coverage of obesity in the South and Midwest from January 2009 to December 2012 and finds evidence to suggest certain regional, cultural elements are invoked to explain obesity in these areas. Gearhart, Sherice; et al. Health Communication, 2012. doi: 10.1080/10410236.2011.629406. Looking at changes in network news coverage of obesity from 1995-1999 and 2005-2009, this study finds that coverage of the subject increased as time went on. Despite increases in coverage, the main issues covered remained the same, with a focus on prevention/treatment and health risks.